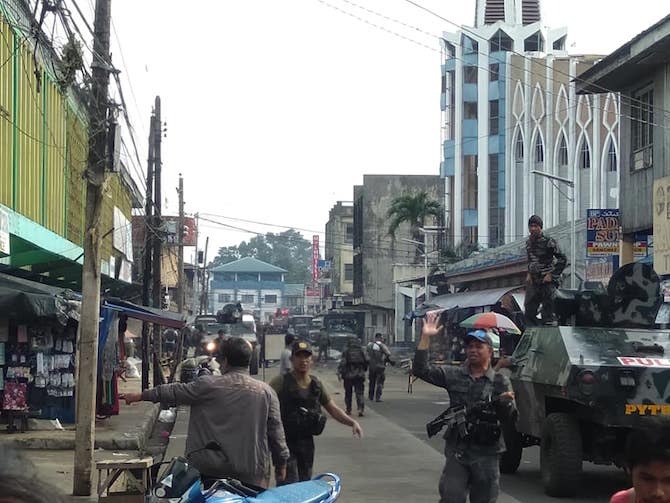 The so-called Islamic State group claimed responsibility for the bombing, which occurred during Mass at the Cathedral of Our Lady of Mount Carmel in the town of Jolo, Sulu province. The group, which often claims responsibility for acts of terrorism, issued a statement claiming two suicide bombers detonated explosive belts inside the church and near its entrance. A second explosion near the entrance shortly after killed at least five soldiers trying to help the wounded. The bishops' conference condemned the attack, calling it an "act of terrorism." The prelates called on Christians "to join hands with all peace-loving Muslim and indigenous communities in combating violent extremism." "We condole with the families of the soldiers and civilians killed by the explosions," said Archbishop Romulo Valles of Davao, the conference president. "I raise my prayers for the dead and wounded," said the pope from Panama where he was attending the World Youth Day celebration. Father Romeo Saniel, apostolic administrator of Jolo, said those who perished "died for their Christian faith." "They bravely stayed in Jolo in spite of the threats and insecurities," said the priest. "No words can describe the sorrow and pain that we feel these days," he added. 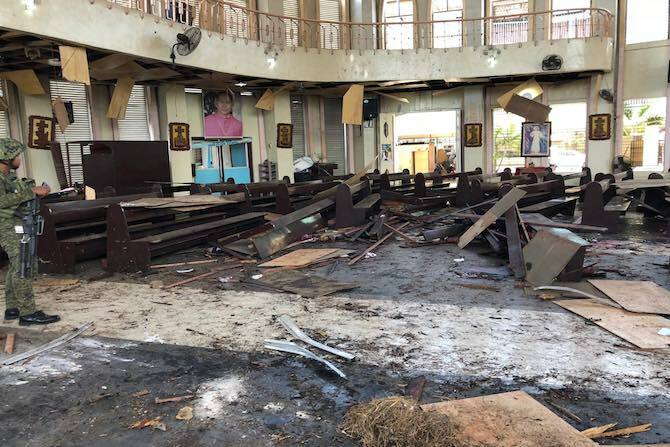 In a joint statement, Cardinal Orlando Quevedo and Archbishop Angelito Lampon of Cotabato, described the bombing as "the most heinous desecration of a sacred place." Cardinal Quevedo once served as parish priest of Jolo while Archbishop Lampon was until recently the prelate of the Vicariate of Jolo. "As former religious leaders of Jolo we totally condemn the criminal bombing of Jolo Cathedral," read the statement. The predominantly Muslim province of Sulu has long been a hotbed of groups claiming allegiance to the so-called Islamic State and al-Qaeda terrorist networks. 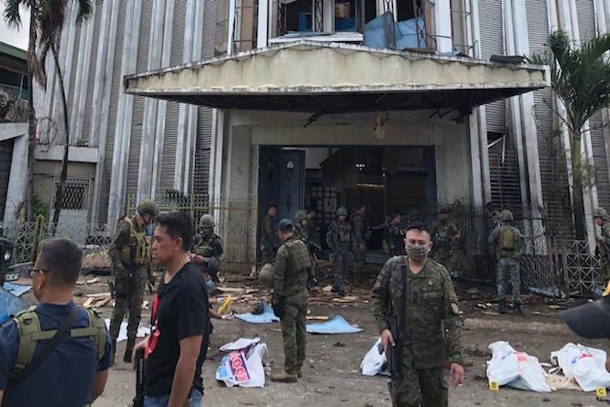 Authorities said the motive was in "retaliation" for the death of a leader of the al-Qaeda-linked Abu Sayyaf group last year. Military spokesman, Lt. Col. Gerry Besana, said investigators had recovered CCTV footage of the bombers just before the attack. According to Autonomous Region in Muslim Mindanao governor, Mujiv Hataman, only Abu Sayyaf had the means to carry out the attack. "It was most likely their handiwork," he told ucanews.com. Hataman said he could not see a link between the attack and the recent plebiscite. "Abu Sayyaf or the [Islamic State] have not stated their position on the [Bangsamoro Organic Law] whether they are for or against it," the governor said. Hadji Murad Ibrahim, the group's chairman, said the attack was "definitely not connected to the plebiscite." He said the proposed Bangsamoro Organic Law "is for peace and it will protect not only the rights of [Muslims] but also non-Bangsamoro people like Christians." "We are not dividing people. In fact we are uniting Muslim and Christian people," he said. "We will pursue to the ends of the earth the ruthless perpetrators behind this dastardly crime," President Rodrigo Duterte's spokesman Salvador Panelo, said. "The law will give them no mercy." Roy Lagarde, Divina Suson, Bong Sarmiento, Ben Serrano, and Jigger Jerusalem contributed to this report.